Published by the American Geophysical Union as part of the Special Publications Series, Volume 66. 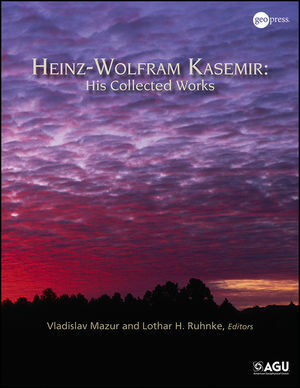 This publication presents the collected works of Heinz-Wolfram Kasemir, a prolific researcher in many branches of atmospheric electricity, with commentaries by Lothar Ruhnke and Vladislav Mazur. Because many of his papers were not reviewed by his peers, it is a rare opportunity to experience the real thinking of a prominent scientist in the field of atmospheric electricity. Kasemir developed a physically-sound theory about the transfer of charges from thunderstorms to global fair-weather areas. Kasemir’s theory of atmospheric current flow influenced calculations of (1) the electric field and current pattern of cloud charges in the presence of conductivity increasing with altitude, (2) the time-function for a lightning electric field that changes from electrostatic to one driven by conductivity, and (3) the effect of conductivity changes at cloud boundaries on their screening charges, and consequently, on surface electric fields. Kasemir’s revolutionary idea that lightning develops as a bi-directional leader with a zero-net charge, proposed in 1950, had a major impact on the development of lightning physics. Kasemir’s analysis of influence charge on lightning channels in a potential field opened up the area of the physical modeling of lightning processes. This project was generously supported by the National Science Foundation through AGS-1138919. Thank you to NSF for its contribution in making this collection available to the public. Vladislav Mazur is a phycisist in NOAA's Oceanic and Atmospheric Research laboratories (Environmental Research Laboratory and National Severe Storms Laboratory) in Norman, Oklahoma, USA. Lothar H. Ruhnke is a Staff Scientist at the Cooperative Institute for Mesoscale Meteorological Studies in University of Oklahoma in Norman, Oklahoma, USA.